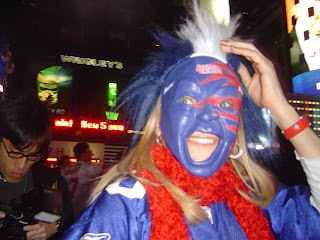 The Adventures of Big Apple Angie: "Everybody's a Giants Fan Tonight"
"Everybody's a Giants Fan Tonight"
So guess what I did last night? After watching the game with my whole church, I was inspired by jubilant garbage truck drivers on the way home to get out there and celebrate like a college kid. After all, I've missed all three recent national titles at UF by just a couple of years, so I've never been at a large scale, riotous sports victory celebration before. 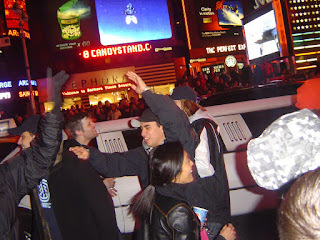 Around 10 p.m., I set out to meet up with some folks at Times Square and experienced one of my favorite NYC nights ever. I stood right in front of the Hard Rock Cafe, the exact spot mentioned above and the center of the melee. 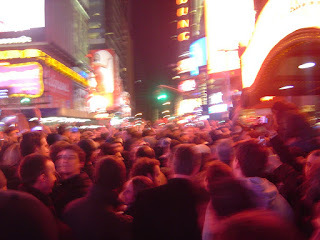 There were thousands of people lining the streets, and while the NYPD did an admirable job trying to keep everyone on the sidewalks, eventually enthusiasm won the night and the crowd exploded into the streets. People were dancing, high fiving, cheering, moshing, hugging... it's a scene I'll never forget. The traffic kept on coming and passengers were hanging out the windows and popping out the top of sunroofs to cheer and wave Giants jerseys and flags. 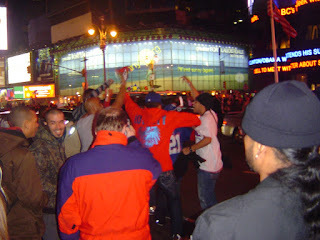 Cheers of "Brady su-ucks," "18 and 1" and "Let's Go Giants" erupted again and again. My favorite part was standing in a group of 50 or so huge guys as we all jumped around singing "Ole, ole, ole, ole... Ole, ole!" 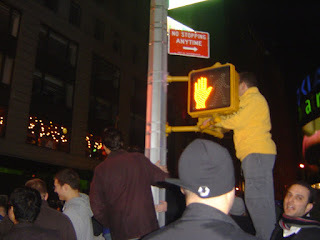 I was secretly a little excited when the cops took out their batons and mace - I love impromptu and potentially dangerous riots (see Bolivia: 2007!) 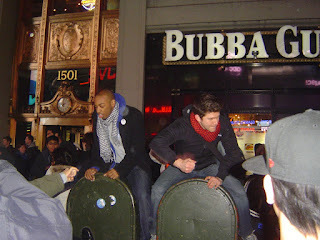 The whole night epitomized everything I love about New York - spontaneity, exuberance and passion! Scroll through a few of my photos from last night, and also check out this link for pics from the NY Post. 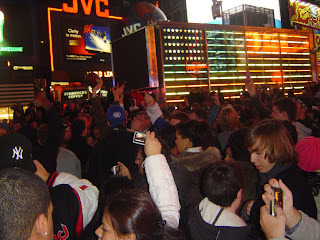 http://www.nypost.com/seven/02042008/sports/giants/02032008_superbowl4/photo01.htm.